The programming on the XGS Pico is a low level language that deals directly with the processor. The code itself is stored on the processor’s onboard flash memory. In order to assemble code onto the processor, an SX Programming Key (Fig 1) is required along with the corresponding IDE (Fig 2). The SX Programming key allows for reading and writing of the hex code onto the processor so that the system can run the program. The programming language is assembly language with an emphasis on the processor. Each register it can operate is a pin on the processor, enabling the code to directly manipulate the system. All the memory is stored on the processor so the transfer speed runs at a decent speed unless the expansion memory is used which will add a couple clock cycles to read the memory. The XGS Pico which uses the SX28 processor has its own programming IDE. 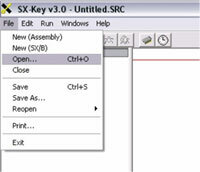 This IDE, known as the SX-key v3.2.3 is used to develop the code for the XGS Pico. This processor language is very low level and does not have a good deal of memory to store the programs. Due to the fact that the SX 28 cannot store much, memory must be greatly considered when programming for the SX 28.